Deploying disk encryption configurations allows you to activate FileVault 2 on computers with macOS 10.8 or later. 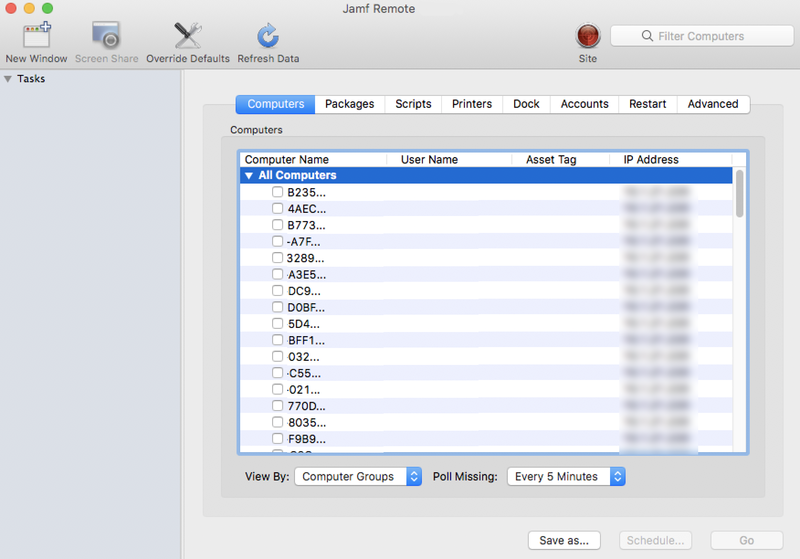 There are two ways to deploy a disk encryption configuration: using a policy or using Jamf Remote. The event that activates FileVault 2 depends on the enabled FileVault 2 user specified in the disk encryption configuration. If the enabled user is “Management Account”, FileVault 2 is activated on a computer the next time the computer restarts. If the enabled user is “Current or Next User”, FileVault 2 is activated on a computer the next time the current user logs out or the computer restarts. In addition, if you are deploying a disk encryption configuration using a policy, you can configure the policy to defer FileVault 2 enablement until after multiple user logins have occurred. To activate FileVault 2 on a computer, the computer must be running macOS 10.8 or later and have a “Recovery HD” partition. Choose "Apply Disk Encryption Configuration" from the Action pop-up menu. Choose the disk encryption configuration you want to deploy from the Disk Encryption Configuration pop-up menu. 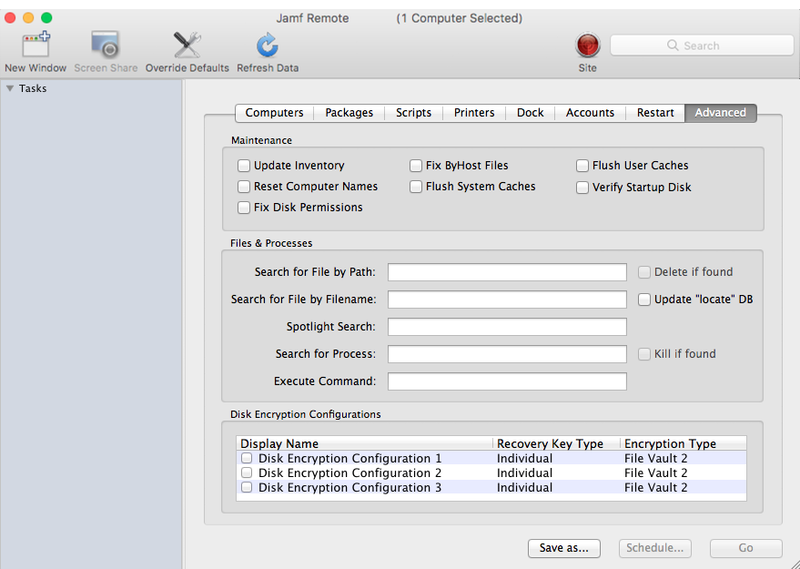 Note: Options are only displayed in the Disk Encryption Configuration pop-up menu if one or more configurations are configured in Jamf Pro. For more information, see Managing Disk Encryption Configurations. Choose an event from the Require FileVault 2 pop-up menu to specify when users must enable disk encryption. In the list of computers, select the checkbox for each computer to which you want to deploy the disk encryption configuration. 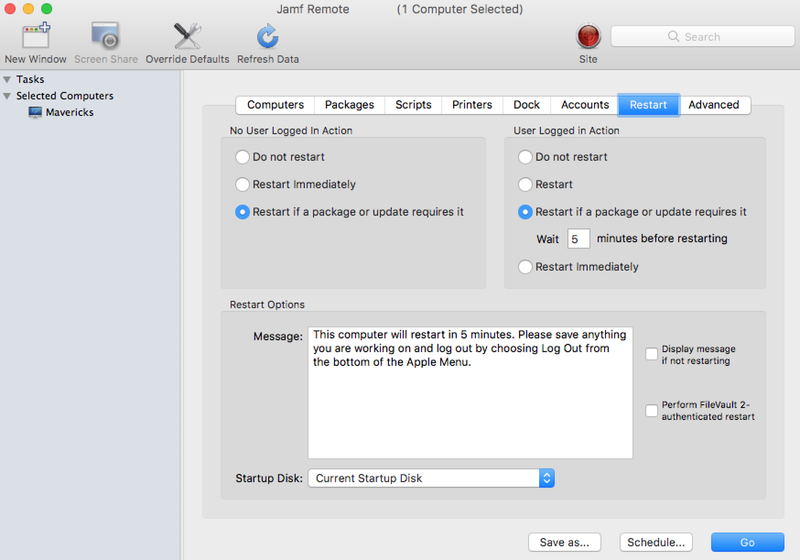 If you want to perform an authenticated restart on computers enabled with FileVault 2, select Perform FileVault 2-authenticated restart. This is applicable to computers with macOS 10.8.2 or later. In the list of disk encryption configurations, select the checkbox next to the configuration you want to deploy. Note: Disk encryption configurations are only displayed in the list if one or more disk encryption configurations are configured in Jamf Pro. For more information, see Managing Disk Encryption Configurations.